Istanbul is up there with places like New York, Paris and London as one of the world’s great cities. Places where each different neighbourhood is almost a separate city in its own right, and where you could spend a few months and still only scratch the surface. But what if you only have one day? Istanbul was the final stop on our cruise itinerary around the Eastern Mediterranean, and with only a limited time to explore, rather than spreading ourselves too thinly across the city, we headed straight for Sultanahmet. Located on a peninsula, this part of Istanbul is the old heart of the city. Formerly Constantinople, it was once an entire city protected by water on three sides and city walls on the other. Today it’s only one part of modern Istanbul, but is home to some of its most famous and historic sights all within a short walk of each other. Here’s a snapshot of what you can see and do in Sultanahmet – although you’d need more than a day to see them all, you can easily combine a few to create your own one-day taster of old Istanbul. The Sultan Ahmed Mosque – aka the Blue Mosque – is one of the most recognisable buildings in Istanbul, with its minarets visible from across the city. But when it was built in 1609 it caused uproar as it had six rather than the usual four minarets. Legend has it that the architect misunderstood the Sultan when he asked for golden (altin) minarets and thought he said six (alti), ending up with one of the world’s grandest mosques. Despite the name, it’s not actually blue on the outside, but the huge domed ceilings inside are covered with more than 20,000 ornately patterned blue Iznik tiles. The soft light through the stained-glass windows and the quiet murmur of prayer make it a peaceful escape from the bustle of the city outside. 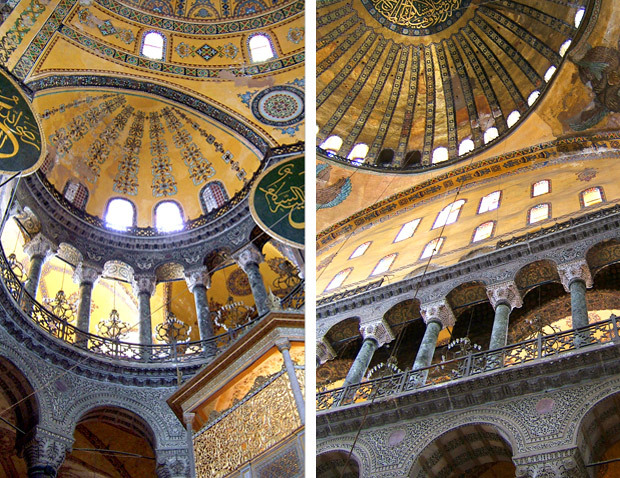 So which would you choose to do if you had a day in Sultanahmet? Or do you have other ideas I should try out next time? Looks fabulous! Turkey was already on my bucket list, but I think it has moved up a couple notches now!